As you may have noticed, we’ve spent the past few weeks introducing you to some of our new roommates — particularly those taking up residence in our new Hall of Paleontology. Well today is a twofer. There are two tyrannosaurs we’d like you to meet — one hails from an excavation site in Montana and the other… well the other comes from the mind of a California dental student (we’ll get to that!). First up is Wyrex, a 65-million-year-old Tyrannosaurus rex specimen that was excavated in Montana by the Black Hills Institute, who’s moving into the new paleontology hall next week. He’s important because of one tiny bone that’s also one humongous discovery. 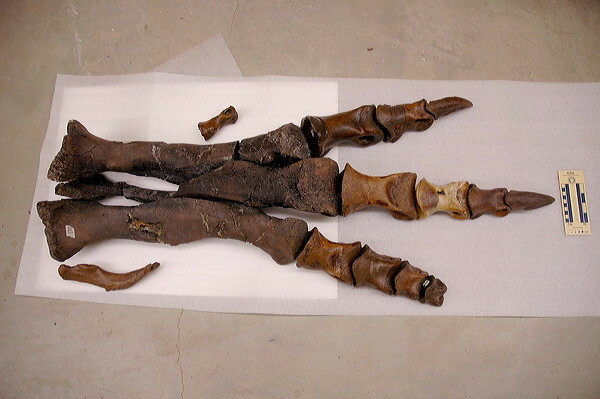 This T. rex has the best-preserved hands and feet of any specimen ever discovered, and boasts a hand bone that has never before been reported. The right hind paw of our Wy-rex. Note that tweensey inner toe, the dino equivalent to our human big toe! “[This] bone would have been enclosed within the palm, and it may have been the remnant of a vestigal third finger,” says Black Hills Institute President Pete Larson. Wyrex is named for Don Wyrick, the rancher whose Montana ranch housed the T. rex until its discovery. The next tyrannosaur we want you to meet is as-yet unnamed. You’ll have to help us with that! This guy knows all-too-well the limitations of even the best-preserved T. rex hands. For any of you who are (tragically) unfamiliar, viral Tumblr T-Rex Trying chronicles the daily struggles of T. rex as he tries to navigate his way through the modern world. Or, as the website puts it, “The Unfortunate Trials of the Tyrant Lizard King.” We got such a kick out of him that we decided we needed a struggling Tyrannosaurus of our own, so we commissioned our very own HMNS frustrated dino from illustrator and creator Hugh Murphy. This guy is having some trouble with a stowaway from the Cockrell Butterfly Center. 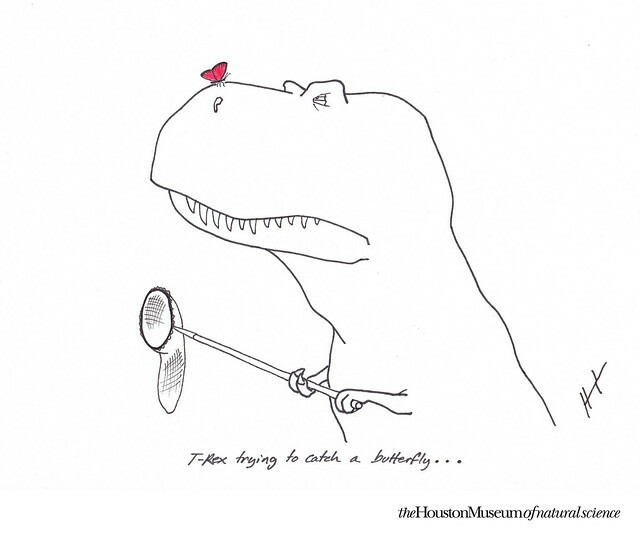 Murphy started T-Rex Trying as a joke with his brothers, and once he put his sketches online it seemed to give the entire Internet a collective chuckle. Hugh, along with his lovely wife, Sarah, are now riding the wave of recognition their hilarious Tumblr has earned them. You can view their archive of sketches here, and watch out for more HMNS versions to make their debut online. Tell us: Which of our new tyrannosaurs is your favorite addition? HMNS + T-Rex Trying? Two great tastes that taste great together! This is delightful!